Bhopal: Games are important to move ahead in life. It was possible to win so many medals in international, Olympic and Asian games due to the high morale and dreams of the Indian players. Madhya Pradesh government is committed to make better opportunities available to the players at an international level. This was said by the Governor Smt. Anandiben Patel at the Rajmata Vijayaraje Scindia All India Womens’ Hockey Tournament award distribution ceremony. The Governor announced to give Rs 50 thousand each on her behalf to the teams who bagged the first, second and third positions in the competition. The Governor presented shield and trophies to the winners on the occasion. Governor Smt. Patel said that it is due to the efforts of the government that players of Madhya Pradesh gave a wonderful performance in archery and water sports in the Asian games and brought glory to the state by winning 5 medals including 3 silver and 2 bronze medals. She said that Madhya Pradesh has carved a niche in national and international level by racing ahead in the field of sports. The international level sports facilities and training being made available through various sports academies run by the Sports and Youth Welfare Department are bringing positive results. Players are winning medals through their brilliant performance in international and national competitions. She said that it is the duty of the coach to teach rules and methods to the players well. Sports and Youth Welfare Minister, Smt. 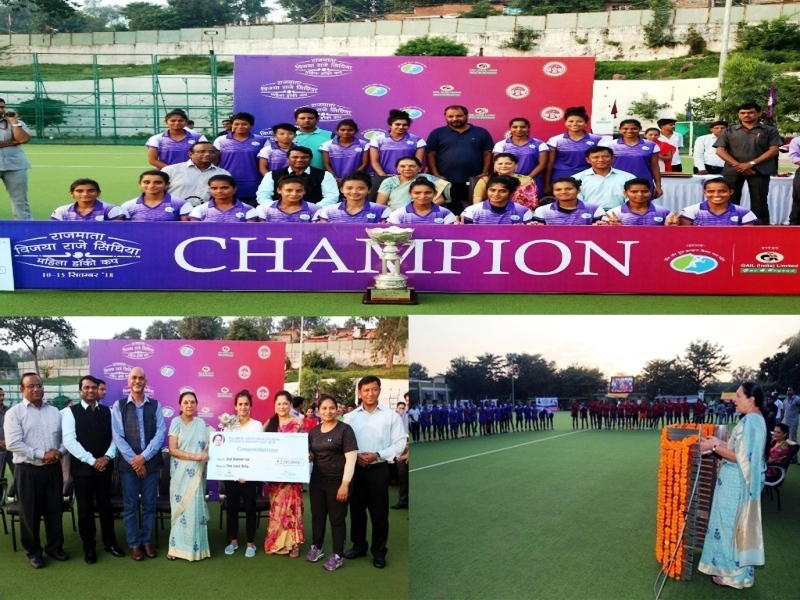 Yashodhara Raje Scindia said that if women players of Madhya Pradesh continue to make efforts like this, they will definitely bring laurels to the state and the country in international and World Cup competitions. She thanked the Governor for the announcement of granting Rs 50 thousand each to the winning players. She said that this is the first time that All India Women's Hockey Competition has been organized in Bhopal.